The most awaited part of a birthday celebration is the cutting of the Cream cake. Let us make your loved ones birthday a memorable one. 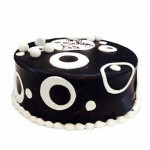 This beautiful black and white chocolate truffle Cream Cake is sure to leave everyone amazed.